FRAMINGHAM, Mass. December 13, 2017 – Worldwide spending on industry cloud in the finance industry (banking, insurance, and securities and investment services combined) is expected to reach $3.2 billion in 2017, which represents an increase of 26% over 2016, according to the International Data Corporation (IDC) Worldwide Semiannual Industry Cloud Tracker. IDC expects the amount to more than double in 2021, amassing total worldwide spending of $7.2 billion. The manufacturing industry (both discrete and process combined) was a larger spender on industry cloud though, relative to its finance counterpart. This industry is expected to spend $4.2 billion in 2017 and achieve year-over-year growth of 23% in 2018. Similar to the finance industry, the manufacturing industry is also set to double its 2017 spending in 2021, reaching a total of $9.2 billion by then. However, these two industries pale in comparison when matched against the spending might of healthcare providers. 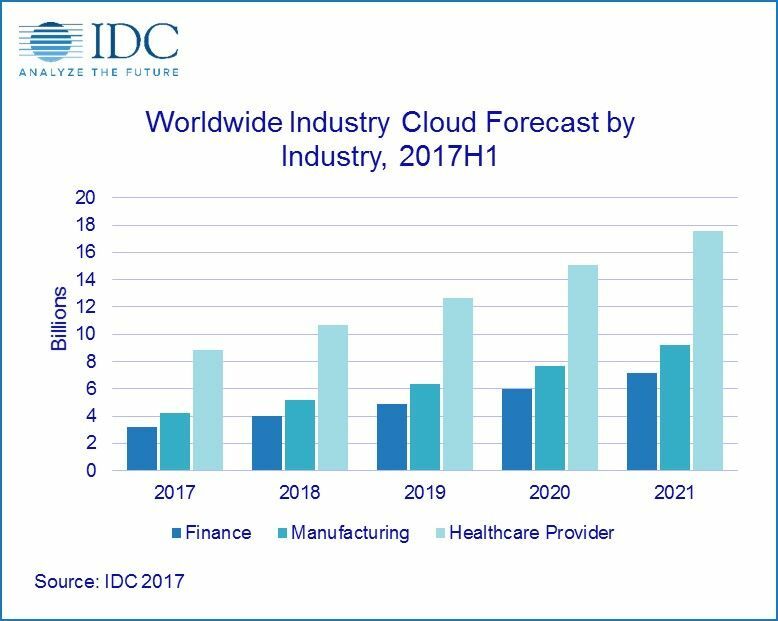 IDC forecasts healthcare providers across the world will spend a total of $8.9 billion in adopting industry cloud solutions during 2017. This industry is expected to increase spending by 20% year over year in 2018 on industry cloud solutions; by 2021, the same industry will spend a staggering $17.6 billion on industry cloud. On a geographic basis, the United States leads by a very large margin in terms of industry cloud adoption across the three industries combined. It is expected to hit 73% of worldwide spend in 2017, followed by Western Europe at 12%. The U.S. is also forecast to grow 20% year over year in 2018 while the other regions are expected to achieve 27% annual growth in the same period. The three industries are expected to spend a total of $330 million on industry cloud solutions in China in 2018, representing very strong growth of 39% year over year. *** Note:** All figures are forecast estimates. "The industry cloud market is young, yet growing fast, with double-digit growth expected to continue for at least the next five to ten years. Dozens of new industry collaborative clouds are emerging each year, helping to foster digital transformation, streamline industry value chains, and ultimately drive innovation, while most software vendors are also shifting their portfolios to focus more heavily on designing industry cloud solutions. Healthcare continues to lead the charge from a vertical standpoint, but many industries have picked up momentum, including manufacturing, financial services, and even government. Though the market's tipping point is still a few years away, IDC believes the industry cloud market represents one of the largest vertical growth opportunities for technology vendors and professional services firms through 2025." "The industry cloud market is without doubt the most strategic long-term opportunity for the IT industry. It's about companies in every industry using the cloud platform model pioneered by Google, Amazon, and others – building big data and digital innovation communities around them – to become the digital innovation hubs of their own industry. IT suppliers who become strategic suppliers to a successful industry cloud win the business of not just that one organization, but of that customer's entire digital ecosystem," added Frank Gens, senior vice president & chief analyst at IDC. For the 1H 2017 release, the IDC Worldwide Semiannu al Industry Cloud Tracker looks at three major industries (Finance, Manufacturing, and Healthcare Providers) while more than 250 vendors are profiled. In the next release, the tracker will expand its scope to include vendor share and forecast data in the Public Sector.